→Can I Install a Kitchen Faucet Myself? The most difficult part about replacing a kitchen faucet yourself is almost always removing the old faucet. It's common for a number of unexpected issues to get in the way, from corroded pipes to hard to reach nuts or bad fitting access. However, once you get to install the new faucet, following the instructions is probably all you need, especially after having done it in reverse. To start, turn off the water by accessing the shutoff valves beneath the sink. 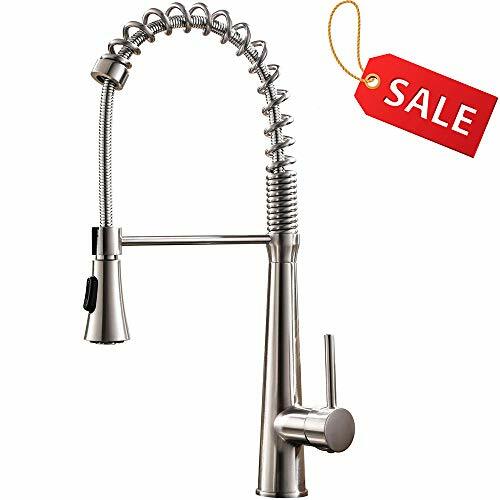 Turn on the faucet to drain any water.Using a small wrench, disconnect the lines for hot and cold water from the shutoff valves. For the next part of removing the old faucet, you'll need a basin wrench. This wrench is made specifically for removing nuts that connect the faucet to water supply tubes. Remove those and then the mounting nuts. You can then remove the old faucet and use the small wrench again to disconnect the sprayer hose. It's a good idea to thoroughly clean the faucet area at this time to prepare for the new faucet. The next step is to install the new sprayer hose by feeding it down the sprayer hole and then up through the center of the faucet. Attach the hose to the sprayer nozzle with an adjustable wrench. When it comes time to connect the water lines with the new faucet, don't put the assembly in place first and then connect it beneath the sink. Instead, make all the connections first and then feed the lines down through their respective holes. Once you get all the attachments set, all you have to do beneath the sink is connect the water supply lines to the shutoff valves. The lines for hot and cold on new faucets can have various lengths, and you might want to make sure you add flexible connectors to allow for easy installation adaptation. If you do this, you can connect them to the supply tubes on the faucets. Use one wrench to hold the fitting still and then a second wrench to tighten the flexible connector fitting. By using two wrenches, you can avoid any damage to the supply lines. If the hole is too tight, you might only be able to add one connector before the faucet assembly is in place. If this is the case, you can attach the second connector beneath the sink after the faucet is installed. The next step is to put all the connectors and lines down through the center hole and make sure everything is lined up correctly. Then you can seat the faucet and position it correctly. At this point, you can go under the sink and tighten the washer and nut combos that will securely hold your new faucet. Start by tightening them with your fingers and then fully tighten them with a basin wrench. Once you've finished getting the faucet in place, you can then attach the other flexible connector to the shutoff valves if necessary. Tighten with a wrench and then turn the water on at the valves. Check the faucet by turning it on and make sure that everything works. A good rule of thumb is to install a faucet during hardware store hours in case you have to make an emergency visit for tools or fittings that you don't have. Make sure you have a basin wrench, a small adjustable wrench or two, new supply tubes and shutoff valves if you don't already have them. Most of the newer brands/models require similar fittings and tools, but make sure to double check the installation instructions before you go to the hardware store. If your faucet assembly has a garbage disposal attached to it, you'll need to disconnect it before removing the old faucet.